Remove turkey from refrigerator 1 hour before roasting. Remove neck and giblets (discarding liver) and reserve for poultry stock. Rinse turkey and pat dry. The best stuffing is made with stale bread, as it keeps the dressing from becoming mushy. Pull out the bread three to four days in advance and let it dry out on the counter. 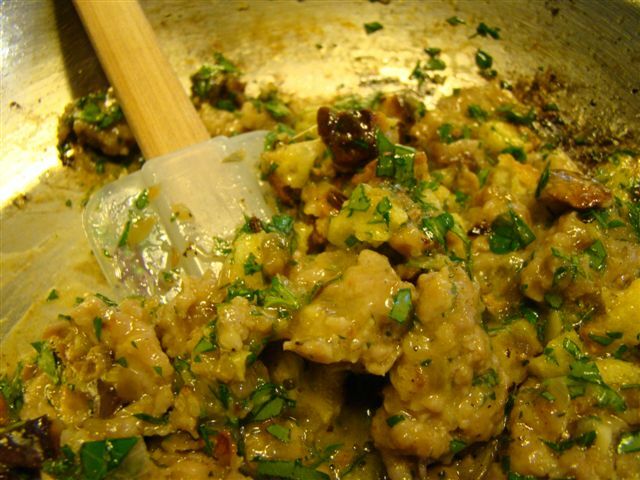 If you don't have enough time, cut the bread into cubes, arrange it on a baking sheet, and toast it in the oven set to 200 degrees F.
Some cooks use diced giblets (heart, gizzard, and liver) in addition to the pork sausage in order to give this cornbread-based stuffing an extra meaty taste.